Kyle Unverferth, 40, of Kalida, changed his plea to guilty on theft in office charges Thursday after Judge Keith Schierloh granted a motion for treatment in lieu of conviction. 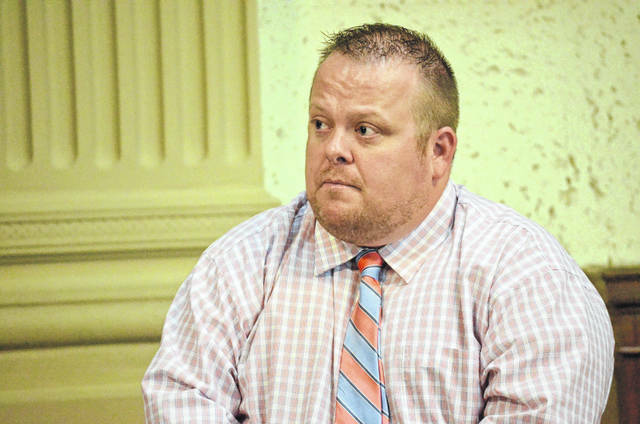 OTTAWA — Former Union Township Fiscal Officer Kyle Unverferth pleaded guilty to theft in office charges Thursday after a judge granted treatment. Unverferth, 40, of Kalida, pleaded guilty to one count of theft in office, a fourth-degree felony; one count tampering with records, a fifth-degree felony, for tampering with township financial records; and one count of knowingly making a false statement, a fifth-degree felony, for filing a false report concerning the other two charges with the Putnam County Sheriff’s Office. He is charged with stealing a Dell computer from the Union Township Trustees some time between Sept. 25, 2017, and Oct. 10, 2017. He said an audit was coming a week from the date he committed the theft and tampered with evidence. He didn’t want anyone else to know about the mistake, so he threw away and shredded documents belonging to the trustees and stole and disposed of the computer and tower to hide his mistake. “After I did everything, when I shredded the paperwork, I didn’t know what else to do,” he said. Unverfeth plead guilty to the charges after Putnam County Common Pleas Judge Keith Schierloh granted the defense’s motion for treatment in lieu of conviction. According to Robert Grzybowski, Unverferth’s attorney, Unverfeth suffers from depression and anxiety which were factors in the crime. After studying treatment paperwork from Pathways Counseling Center in Ottawa and taking into account Unverferth’s criminal record — nothing but a speeding ticket almost 15 years ago — Schierloh granted the motion. Schierloh ordered Unverferth to undergo a two-year term of rehabilitation and to spend 10 days, with credit for one day served, in the Putnam County Jail on work release after providing proof of employment. He was also ordered to pay restitution of $1,584. Unverferth must complete a mental health treatment plan at Pathways and agree to not use alcohol or drugs, with random drug and alcohol screenings to make certain. Some prescription drugs may be allowed with permission. The agreement is similar to community control. If Unverferth violates any requirements, he would face a maximum of 42 months in jail and $10,000 in fines.